The Japanese Maple is one of my favorite trees. When I was a little girl, I would sit under the stunning crimson leaves in summer and read great Hemingway or Poe. As I grew older, I noted several variations of the tree throughout my New England region. Not restricted to such a small area, the Japanese Maple grows with ease throughout the United States, its distinct color variations making it a gardener’s tree of choice. Best in partial shade with the protection of taller trees, the Japanese Maple will grow and add something special to the property on which it stands. Growing gracefully to between 2 and 30 feet tall in either containers or well-drained soil, the Japanese Maple brings a versatile gift to its planter. Season in and season out, the maple will offer feathery, lacy, or palm-shaped leaves it its rounded, cascading, or weeping shape. A companion tree at its heart, the Japanese Maple will provide a gentle shade to rest in or a piece of nature’s artwork to observe. Sunlight – Plant in a partially sunny area with significant access to afternoon shade. Different amounts of sunlight will affect coloring of leaves and overall plant health. Soil – Plant in well-drained, moist soil that is not overly wet. Shallow roots also mean mulch is needed around the base of the tree to improve drainage and water absorption. Water – Water every 2-3 days for the first month, and then once a week after that. Pruning – Pruning can be done throughout the year, with the exception of spring. If only pruning once, aim for late summer. Pruning Note: There is some controversy as to the best time to prune. While many botanists recognize the schedule identified above, some suggest it is much easier for beginners to prune in late fall or winter. Japanese Maples are like an apartment in Paris: location is essential to success. 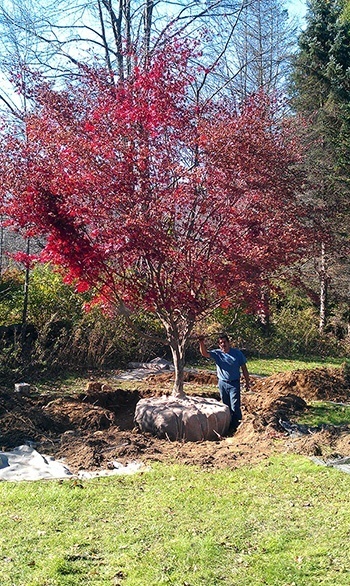 Japanese Maple Trees require a shady area, where they will be protected from late afternoon and evening sun. 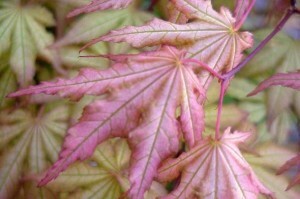 The small, delicate leaves of the Japanese Maple are easily scorched and shriveled, leaving an unhealthy looking tree. Explore your property to find an area where the tree will be protected from the sun. Japanese Maples like dappled shade, which is when taller shade trees provide protection from the more direct sun rays. This is not to say the Japanese Maple should not have ANY sun. No sun, and your tree will likely forgo its stunning fall colors for more photosynthetic green leaves, dropping those leaves prior to changing the vibrant colors for which they are known. Alternatively, too much sun, and the tree’s leaves will wither. The best place to plant your Japanese Maple may vary based on state location. In southern states, the tree will benefit from four to six hours of morning sun and evening dappled shade. This will affect primarily the coloring of the leaves unless the sun is excessive, which then may cause further damage. Dappled shade is not mandatory in northern states, where cooler temperatures and wetter weather can offset the difference. However, it can be beneficial to have some shade available even in these more northern locations. Japanese Maples are not large. Even unpruned, the maple will rarely reach above 30 feet. Ornamental in nature, the Japanese Maple grows approximately two feet annually, with growth slowing significantly after ten years. The Japanese Maple forms varied appealing shapes that add character to your yard, and it also grows about 20 feet outward. The Japanese Maple, and its many variants, can be quite small, some even residing as bonsai trees indoors. If you find your maple is not growing at the expected rate or is receiving too much or little sun, transplantations are possible. As long as you cut a wide radius around the tree’s trunk, the Japanese Maple should easily survive the procedure. However, it is important to note that if the tree is unwell above ground, it is often unwell below. Time of year, age, and size all play a factor in the successful transplantation. Transplant the maple in late winter or early spring. This way, the root system will be expected to quickly get to work caring for the tree. On another note, it can be helpful to prune prior to doing this, as the stress to the root system will be minimized if it has less branches and leaves to feed. 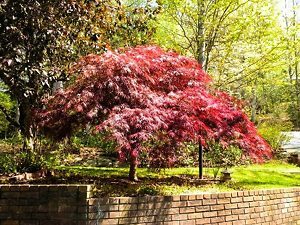 Both young and old trees can survive a transplant; however, the older your Japanese Maple the larger radius you will need to cut in order to move it. This is because the feeder roots, those that store the tree’s food and water, will be located a further distance from the tree base. In this way, size too is important to consider. Like young trees, smaller trees have smaller root systems. A 12-18 inch root ball will likely be needed for trees less than 3 feet tall with a trunk size of about 1 inch. Much larger, and the tree will likely require a root ball of between 18 – 24 feet, weighing upwards of 200 lbs! Acer palmatum refers to the species of maple native to several Asian countries, including Japan, Russia, Mongolia, and China. Although only three subspecies are recognized by botanists, the Japanese Maple will look entirely different based on the habitat. There are 1,000 variations on the A. palmatum, and these are called cultivars. Your Japanese Maple can have everything from pinkish-white leaves with green veins (‘Aka shigitatsu sawa’) to yellow-green leaves tipped with orange (‘Katsura’). Three of the most popular Japanese Maple Trees are the Red Dragon Japanese Maple , the Weeping Japanese Maple Viridis and the Bloodgood Japanese Maple. 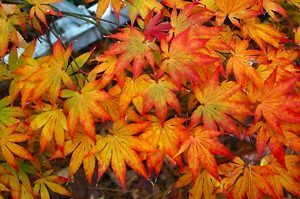 Regardless of your distinct variation, the Japanese Maple is sure to delight as it brings stunning seasonal colors and a thoughtful, meditative order to your front or backyard. Japanese Maples do not like an overly salty soil, so be sure to test your soil before planting! Too much fertilizer will cause stress to your tree, so do not over-mulch. Too little or too much water can damage your tree’s leaves. Aim for watering 2-3 times a week in the first few months, and then only once a week afterwards. You can purchase a Japanese Maple in a variety of shapes – upright, weeping, cascading, rounded, and more – pick a shape that best compliments your property. Do not forget to enjoy a good book under your Japanese Maple’s whimsical shade! Can these trees be planted indoors???? It depends on a lot of factors and may be more trouble than it’s worth. The main issue is that Japanese Maples need a period of dormancy that can’t be achieved by a constant 70 degree temperature. There have been people who’ve simulated colder temperatures and Japanese Maples are a popular bonsai tree, so it can be done. It’s also important to mention that there’s at least one native maple does grow in Florida and an Acer rubrum resides at the Selby Botanical Gardens in Sarasota. In transporting a Japanese maple as a gift via car, extreme heat caused most of leaves to shrivel and looked burned. Can it be saved? I have a Japanese maple tree which was beautiful until from what I am told a green Japanese attached itself to the tree. Now I have green leaves and red leaves. The people who take care of all the lawns in our condo association told me if he cuts the large green limbs off my tree, it will die. He also said he has not seen this for a long time. However, I have a friend who has a smaller red Japanese tree had the same thing happen to her tree. She cut the green limbs off and killed that section with Roundup and taped off each section. What is the correct answer to this situation? I have a red Japanese tree which is about 9 years old. Within the last couple of years a green Japanese? maple attached itself to my tree. I consulted the man who takes care of our condo association and he said he has not seen this for years. He said if he cuts off the limbs of the green branches, my tree will die. However, i have a friend who had a similar situation and she cut off the green limbs and then put on Roundup where she cut off the limbs and then taped off the section where she cut off the limbs. Her tree survived. Any information you can give me will be greatly appreciated. My japeneese maple lost all its leaves. I think it was to wet where I planted it. Will it come back? I already dug it up and put it back in a pot. 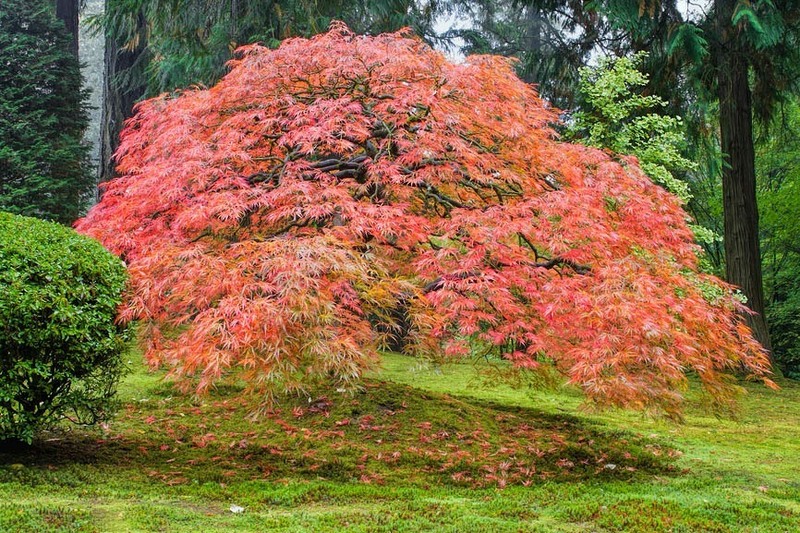 What is the average life of a Japanese Maple?